Targi Kielce is located in the western part of the city, near Kielce-West road junction (trunk-roads number S7 - Warsaw and Krakow and 74 - and Łódź and Lublin). Convenient transport system connections - Targi Kielce can be accessed directly off the S7 and 74 roads. 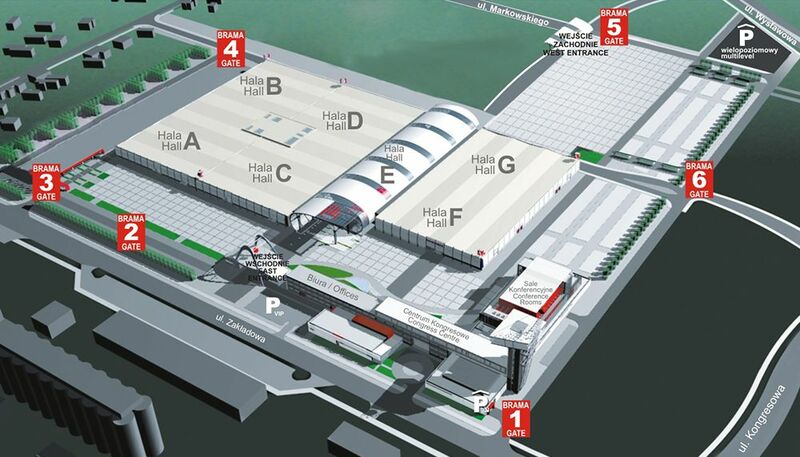 The total exhibition grounds area - 90 000 m2. Expo Halls (the seven interconnected halls) of a total area 36 000 m 2 - equipped with all kinds of utilities necessary for exhibition purposes (power and water supply, compressed air, telephone network, Internet, air conditioning system). Full bathroom and toiled facilities, catering outlets, technical backup facilities, sound system also available in the expo halls. In the indoor fair-ground area there are the two, self-contained restaurants (high standard), two fast food outlets and two coffee bars . The exhibition facilities can be entered through the modern entry terminals (eastern and western side) equipped with electronic registration systems for exhibitors and visitors. Additionally, the fairgrounds can be entered via 6 independent gateways. The outdoor area can be used as presentation-grounds, exhibition area or parking lot for the participants. Possibility of holding parallel, independent events of various nature in different facilities, expo halls and rooms. The 1,000 m2 foyer - the exhibition and banquet space with natural lighting.